Omri graduated from the University of Kosice in Slovakia in 2011. Shortly after graduation he moved to the UK to take up a position in a busy first opinion practice, where he worked for two years and developed a keen interest in Cardiology. He then spent one year doing a rotational internship at another referral centre before joining SCVS as a Cardiology intern. 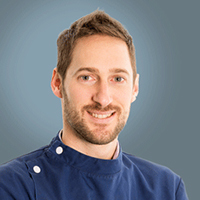 Omri is currently working towards his certificate in advanced veterinary practice in small animal cardiology. Following his internship, Omri plans to continue training towards becoming a cardiology specialist.